Last Saturday, 31 October, suspected Islamist militants carried out two machete and gun attacks, against two offices in different neighborhoods of Dhaka, the capital city of Bangladesh. They injured three men in the first attack: poet Tareq Rahim and publisher Ahmed Rashid Tutul were critically injured in the attack on Tutul’s publishing house, Shuddho-Shor, and an atheist blogger Ranadipam Basu was also hurt. 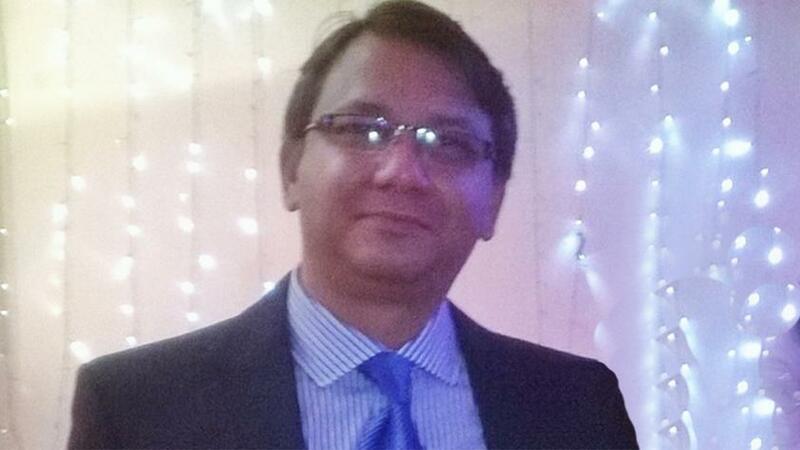 In the second attack, the publisher Faisal Arefin Dipan was hacked to death. This attack also took place at his offices, of the publishing house Jagriti Prokashony. Both publishers had printed books by humanist and freethinking author Avijit Roy, who was himself killed earlier this year. The attack follows four murders since February this year of humanist and atheist writers and bloggers, as well as a string of recent attacks on foreigners, including the murder of Japanese national Kunio Hoshi in Rangpur, and a bomb attack on the Shia community during Ashura that left one dead. 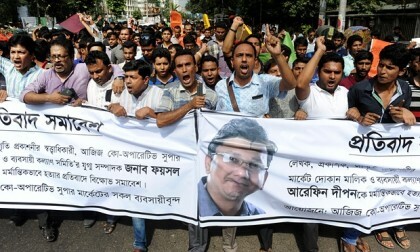 Hundreds of people, including writers, publishers and bookshop owners, took to the streets of the capital, Dhaka, on Monday to protest against what they said was government inaction over a string of attacks, including the murder on Saturday of a publisher of secular books. “This is not an isolated incident. They first started killing authors, then the bloggers and now they’ve targeted the publishers,” Mustafa Selim, head of the Bangladesh Creative Publishers Society, told reporters. … “The people who have so far fallen victim to the attacks are thinking people, those who believe in freedom of expression, and those who believe in secular values. A series of killings have taken place but now the focus is on publishers … I feel absolutely traumatised,” said Mohiuddin Ahmed, a publisher in Dhaka. About 1,000 Bangladeshi authors and teachers marched through the streets of the capital on Tuesday… “No one is safe. First they killed bloggers. Now they are targeting publishers. 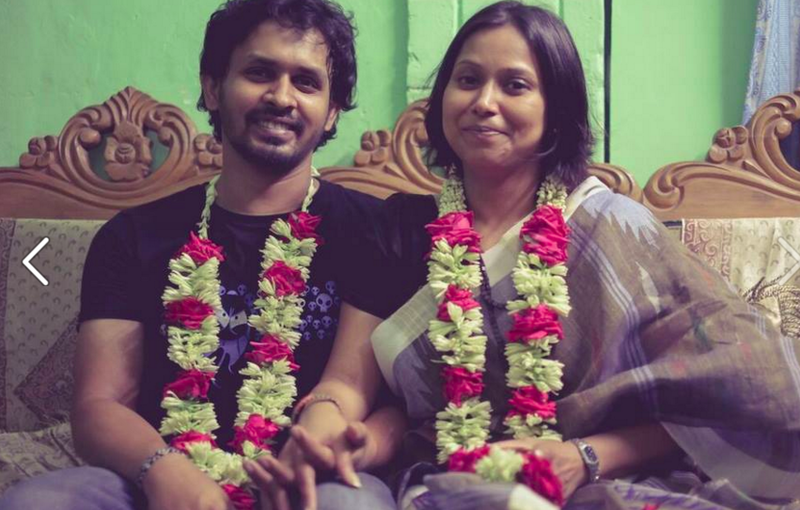 Soon they will attack anyone who is progressive-minded,” said Khaledur Rahman, an author who is himself facing a death threat. And there was a parallel protest in London, UK. Huffington Post Live covered the attacks with a section including a journalist, a blogger, an International PEN member, and Michael De Dora from our partners at Center for Inquiry (US). Blogger Arifur Rahman was interviewed on the BBC. Center for Inquiry Canada (CFIC) condemned the attacks, and given that the poet Tareq Rahim (critically injured in the first attack) had recently married a Canadian citizen, Monika Mistry, they called on the Canadian government to work to ensure his safety and that of all those under threat. … One of CFIC’s Bangladeshi contacts has asked, “Is it so difficult for a country to accept these 40-50 endangered people?” CFIC and our humanist, secularist and human rights-oriented colleagues pass that question on to the Canadian government. Can Canada not find compassion for a minority targeted by religious terrorists – particularly those with Canadian connections. Our partners at International Humanist and Ethical Union (IHEU) presented information about those who had been killed, condemned the attacks, and immediately expressed concerns about the response of the authorities so far, and the wider ramifications of the latest attacks. “… How many more times must we see these bloody and callous acts of hatred before the authorities wake up to the true problem. Officials must stop threatening to arrest, and stop blaming atheists themselves for writing books and blogs. To victim-blame them will continue to empower the fundamentalist killers and undermine the very basis of secular democracy itself. And indeed, as predicted, the response by political officials has been yet more confusion, head-in-the-sand disavowal, and casting blame on political rivals (without apparently any shred of evidence). Regrettable and shameful indeed, Hanif. Prime Minister Sheikh Hasina alleged that Khaleda Zia was out on a killing mission assassinating Awami League leaders, activists, writers, publishers and foreigners in her bid to tarnish the country’s image abroad. “The BNP leader has now engaged in a killing mission for tainting the country’s image, after being politically defeated in her efforts to topple the present government through killing people in the name of hartal and blockade,” the premiere said. The PM came up with the allegations while addressing a public rally organised by the ruling Awami League at the city’s historic Suhrawardy Udyan, marking the Jail Killing Day commemorating the assassinations of four national leaders. Back in November 3, 1975, four national leaders and heroes of the country’s Liberation War — Syed Nazrul Islam, Tajuddin Ahmed, Captain Mansur Ali and AHM Quamruzzaman — were assassinated inside Dhaka Central Jail. … “After tarnishing the country’s image by killing foreigners, she has now engaged in assassinations,” the PM added. Hasina said the BNP leader’s target is to assassinate AL leaders, activists, writers, publishers and foreigners. “Whenever there has been any investigation into any killing, it was found that the killers were either engaged in Chhatra Shibir or Chhatra Dal politics during their student lives,” Hasina said. What’s so extraordinary here is that if there were any evidence to this effect then of course Zia could be arrested, and yet none is presented, so this appears to be nothing but a diversionary and desperate political attack, entirely unhelpful to finding those responsible. It is also remarkable that the prime minister feels able to refer so confidently to “the killers” when the authorities have failed to actually convict anyone for any of the anti-atheist murders this year. These two apostates frequently published books in which, the honor of the prophet was violated. These two publishers were worse than the writers of such books, as they helped to propagate those books and paid the blasphemers handsome amount of money for writing them. These secular and atheist publishers waged war against the religion of Islam in every possible ways. Every possible way… Beside, y’know, actually doing anything war-like. (1) Those who insult or vilify Allah, the most High, our prophet Muhammad or the religion Islam. Replying, perhaps, to the worldwide outrage against the string of attacks, the statement insists, “We are not targeting every atheist bloggers. We don’t have problem with other religions or beliefs but we will not tolerate anyone insulting prophet Muhammad. We are targeting those who are insulting our Prophet in the name of Atheism, Free Speech or Free Thinking.” The four bloggers killed this year wrote about civil rights issues, science, humanist values, secularism, free expression, social justice, and yes, sometimes questioned and criticised in some cases certain religious beliefs and practices. But of course, the content doesn’t really matter when it’s the blood-thirsty men with machetes who get to decide what counts as “insulting our Prophet”. Whether or not these statements really are issued by someone directly connected to the killers is not possible to establish, though the change in last Saturday’s targets — from writers to publishers — does cohere with the broadening of the targets suggested in the text.